This entry was posted in E-Book Readers, Kindle 3, Kindle 4, Kindle Keyboard, Kindle Touch and tagged ads, amazonlocal, Kindle 3, kindle 4, Kindle Keyboard, kindle touch, special offers by matthew. Bookmark the permalink. FYI – We’ve been able to opt-in for about a month now. The Special Offers setting doesn’t show up for my Kindle DX. 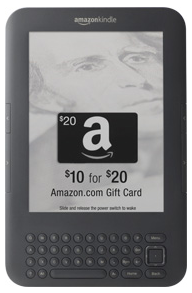 I’m not seeing the option for my Kindle 2 either. That’s actually good to know. I stumbled on it by accident about a week ago. To the best of my knowledge, the Kindle DX doesn’t support special offers. I don’t think it ever will, I’m afraid. There is every indication that Amazon has all but given up on updating that model, despite how useful many of us find it. I enabled the Special Offers on my pre-SO K3. So far, no objection to the ads on the screensaver (screensleeper?) and the banner ad at he bottom of the Library screen. It’s no more annoying than seeing the same screensleeper images over and over and over again.